For five days in December 1908 the body of Cyrus Teed lay in a bathtub at a beach house just south of Fort Myers, Florida. His followers, the Koreshans, waited for signs that he was coming back to life. They watched hieroglyphics emerge on his skin and observed what looked like the formation of a third arm. They saw his belly fall and rise with breath, even though his swollen tongue sealed his mouth. As his corpse turned black, they declared that their leader was transforming into the Egyptian god Horus. Teed was a charismatic and controversial guru who at the age of 30 had been “illuminated” by an angel in his electro-alchemical laboratory. At the turn of the twentieth century, surrounded by the marvels of the Second Industrial Revolution, he proclaimed himself a prophet and led 200 people out of Chicago and into a new age. Or so he promised. The Koreshans settled in a mosquito-infested scrubland and set to building a communal utopia inside what they believed was a hollow earth—with humans living on the inside crust and the entire universe contained within. According to Teed’s socialist and millennialist teachings, if his people practiced celibacy and focused their love on him, he would return after death and they would all become immortal. Was Teed a visionary or villain, savior or two-bit charlatan? Why did his promises and his theory of “cellular cosmogony” persuade so many? 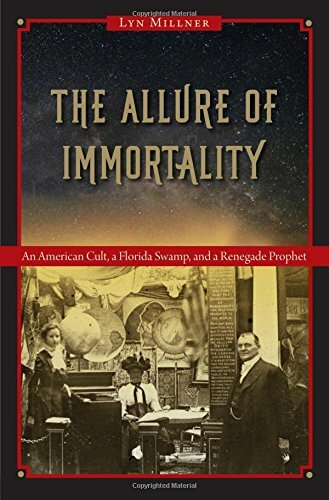 In The Allure of Immortality, Lyn Millner weaves the many bizarre strands of Teed’s life and those of his followers into a riveting story of angels, conmen, angry husbands, yellow journalism, and ultimately, hope.